Kyrie Irving's measurements (6-1 ¾ without shoes, 6-4 wingspan, 8-3 standing reach, 191 pounds) didn't quite live up to the ridiculous standard set by John Wall (6-2 ¾ without shoes, 6-9 ¼ wingspan) last season, and falls a bit short of Derrick Rose (6-1 ½ without shoes, 6-8 wingspan) and Russell Westbrook (6-2 ¼ without shoes, 6-7 ¾ wingspan) in terms of wingspan. However, he has the same height and standing reach as Deron Williams (6' 1.75" without shoes, 8-2 standing reach, 6-6 ¼ wingspan) and the same length as Chris Paul (5-11 ¾ without shoes, 6-4 ¼ wingspan, 7-9 standing reach), to put those comparisons in perspective. Irving breaks the mold of the freak athletes we've seen drafted at his position in recent seasons, and he probably won't be defending many shooting guards on the NBA level, but he was amongst the biggest stars of the weekend in media interviews. His decision not to participate in the basketball or athletic testing portions of the NBA combine was widely publicized, but hasn't proven significant amongst teams. See how Irving stacks up historically with other point guards drafted in the top 15 in our measurements database. 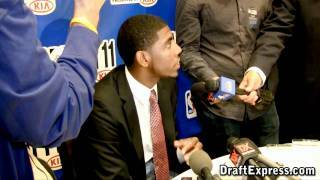 -Will the Cavaliers pick Kyrie Irving? What kind of prospect is Kyrie Irving? Can he help or hurt himself with the way he plays in the NCAA tournament? How much can we expect him to play? Irving's terrific talent was on full display at this tournament. After watching him in this setting, there's little doubt he's going to have an immediate impact for Coach K at Duke, even though his role might be smaller than some of the other heralded freshman. Irving has a great body and good size at 6-2. Offensively, he's as skilled and versatile as you can expect from a player his age. He's a very good athlete who can get to the basket in a variety of ways and is particularly effective in the pick-and-roll. Irving has a nice stroke from the perimeter and made a number of shots from outside (both with his feet set and off the dribble) over the course of the week. Perhaps most impressive is the way he competes on the defensive end, though. He takes great pride in his work on this end of the floor, showing great fundamentals, a high effort level and terrific smarts. He gets right up in his man's grill and locks him down. Even when his team was up by a huge margin, he was still out there getting after it on every possessionhe even attempted to take charges. Having only gotten some fleeting glances at top prospect Kyrie Irving (#5 Scout, #9 Rivals, #6 ESPN) in our somewhat limited exposure to the high school scene, the St. Patrick point guard was obviously high on our list of players to evaluate. What we got was a bit of a mixed bag, with one very poor half followed up by one very strong one. Irving's physical tools do not appear to be overwhelming on first glance relative to most top point guard prospects, as he sports average size and good, but not incredible athleticism. He's a quick guy with solid change of speed ability, but is not incredibly fluid and struggled badly trying to stay of the extremely aggressive Cory Joseph. Where Irving clearly shines is as a scorer, displaying impressive instincts and a very complete game for a player so young. He's extremely aggressive in transition, making quick, strong moves to the basket any time he sees even a hint of daylight and doing a good job finishing at the rim. He can also create in the half-court, looking like a dangerous threat on the pick and roll with his ability to slash to the basket or pull-up off the dribble. Irving has a terrific shooting stroke both in catch and shoot situations or elevating off the bounce, showing a real knack for throwing the ball in the basket in some very tough situations. He also appears to have very nice court vision, threading the needle with some very difficult passes at times. On the downside, Irving is at times overly aggressive looking for his own offense and tends to freeze out his fellow teammates, something that is not rare in the least bit from a talented scorer at the high school level. He tends to over-penetrate at times and run into brick walls in the process, and heaved up a couple of extremely bad shots from the perimeter with multiple defenders draped all over him. Irving is another player that we need to see a few more times before we're able to get a more accurate read on. He plays a very frenetic style of basketball that probably will have to be toned down under his coaching staff at Duke next season, but obviously has some terrific gifts that clearly can't be taught. He'll surely be invited to all the major events on the high school all-star circuit this spring, which should give us a much a better opportunity to evaluate him.